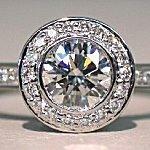 For women interested in contemporary, modern rings, bezel settings are one of the most popular choices. Sleek and fashionable, these understated designs are practical and elegant at the same time. A bezel is an elevated collar of metal that surrounds a gemstone. This distinctive setting gives a ring a very low profile, making it the perfect choice for active individuals who do not want to remove their rings frequently; the bezel provides greater protection than prong or other elevated engagement ring settings. In contrast to the flush setting, which has no collar surrounding the stone, the bezel is bolder and more noticeable. One prominent myth about bezel settings is that they obstruct the stone, making it less brilliant. In fact, the majority of light entering a diamond comes through the stone's table or top, therefore a bezel does not affect its characteristic glitter. In fact, most bezels offer greater protection for the stone, not only because they are a secure setting that protects the delicate edges of the stone, but they also prevent dirt, dust, and oil from building up on the gem - precisely the factors that will cause a stone to become dull and cloudy. In addition to full bezels that completely surround the stone, partial bezels are becoming more popular. These trendy designs only arc across a portion of the stone, and the exact length of the bezel portions can vary according to the stone's size, diameter, and designer's preference. When investigating a partial bezel, however, be certain that the setting is secure enough to hold the stone without problems. Inexperienced patrons often assume that a bezel set engagement ring is a simple, plain design and cannot be adapted to unique configurations. On the contrary, bezel-set rings have just as wide a range of styles as other settings. In addition to the partial bezel, symmetrical designs are popular choices as well as using a bezel in an overall pave setting, as part of an intricate filigree pattern, or incorporated into a Claddagh or Celtic ring. 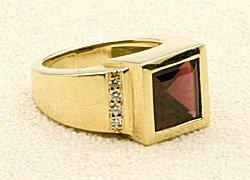 Accent stones are frequently used with bezel rings, though the stones are either bezel, flush, or channel set to continue the submerged, subtle look of the ring.The most common shapes to appear in bezel settings are round stones, though princess and emerald cuts are also popular choices, though they are more difficult to find. Eternity rings frequently use bezel designs, as do right hand rings and other personalized pieces. Bezels are often incorporated into men's engagement rings because of the greater protection and subtler image they provide. A tight, secure fit that is thick enough to hold the stone steady over time. The stone should be level and its principal facets aligned with the symmetrical design of the ring (along the band or with the edges of a partial bezel). The rim should be even or symmetrical with no sharp protrusions. There should be no damage to either the rim of metal or the stone where the two meet. Because bezel settings are more difficult to design, they are typically more expensive than traditional prong settings. To offset this cost, however, a couple may be able to choose a lower quality stone - perhaps one with flaws or chips along its edge that will be hidden and protected by the bezel. Despite the fact that bezels are naturally more secure and protective of the stones they encase, they should still be cared for gently. Never use a pin or other sharp object to dislodge debris from around the setting - that could potentially scratch the stone. If the setting becomes loose, a professional will be needed to tighten it; inexperienced repairs could bend or flex the setting and weaken it further. Having a qualified jeweler inspect the ring periodically is a wise precaution against problems or preventable damage. Bezel settings are rapidly gaining popularity as modern, elegant engagement rings. With a wide range of styles available in this protective yet sleek design, many women and men are finding bezels to suit their preferences and individual tastes with contemporary flair.